A couple of weeks ago, Sempra Energy signed commercial development agreements with Mitsubishi Corporation and Mitsui & Co., Ltd to develop and construct an LNG export terminal at the company's existing Cameron, LA LNG import facility. In January 2012, Sempra received DOE approval to export LNG to any country with which the U.S. has a Fair Trade Agreement, which is the first step in getting an LNG export facility approved. Sempra expects to receive Federal Energy Regulatory Commission (FERC) approval for the export facility in the second half of 2013, at which point it could begin construction on the facility if it's still deemed feasible. commit the partners to negotiate tolling agreements for 8 Mtpa of the planned 12 Mtpa. Sempra is negotiating with other partners for the remaining 4 Mtpa. Cameron is behind Cheniere Energy's Sabine Pass facility in terms of schedule, but it is on track and moving forward. 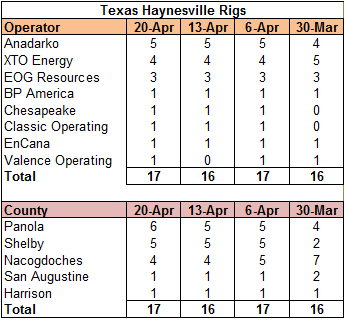 The Haynesville Shale rig count was down by one last week, bringing the current number of rigs in the Haynesville Play down to 46. Louisiana was down one to 29, while Texas held at 17. 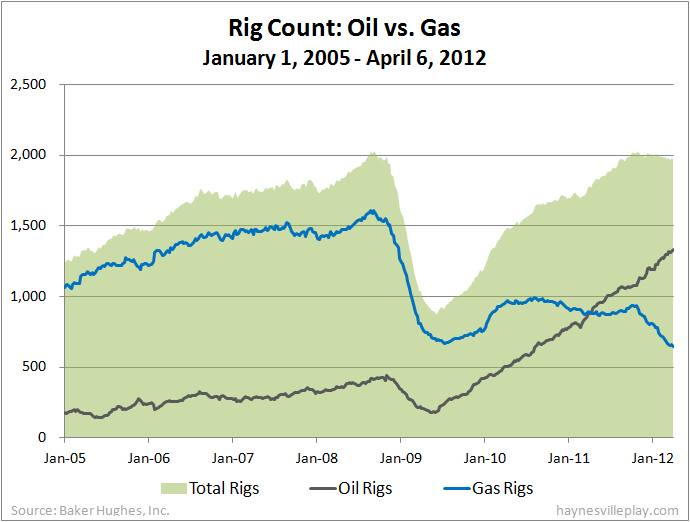 The Baker Hughes rig count dropped by 27 rigs this week to 1,945, the lowest U.S. count since August 5, 2011. Oil rigs were down nine to 1,328, gas rigs were down 18 to 613 and miscellaneous rigs held at four. By type, horizontal rigs were down 16 to 1,139, vertical rigs were down eight to 563 and directional rigs were down three to 243. Under intense pressure, Chesapeake Energy today announced that CEO Aubrey McClendon has begun negotiations with the company's board of directors to terminate the infamous Founder Well Participation Program, which has flummoxed many investors and nearly all good corporate governance types. The plan is part of McClendon's employment contract and was set to terminate Decemer 31, 2015, although it could have been renewed. No details yet, but it will require an amendment to his employment contract. It will be interesting to see the terms of the new deal, but I doubt Aubrey will get left out in the cold by his hand-picked board. 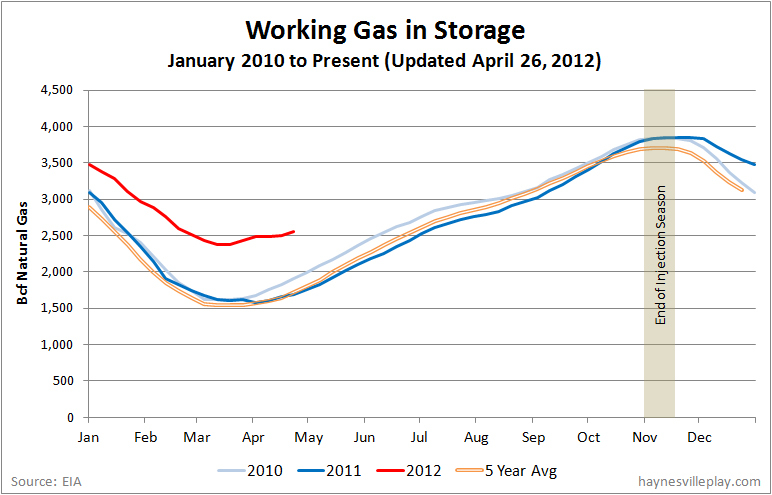 The weekly EIA working gas in storage report showed a 47 Bcf increase, bringing the total gas in storage to 2.548 Tcf. Last week's data was adjusted downward by 11 Bcf because of a revised submission, which means that the previous week's injection was only 14 Bcf. This week's injection is identical to the five year average but 34% higher than last year (+35 Bcf). The current storage level is 52.0% above last year (1.676 Tcf) and 55.4% above the five year average (1.64 Tcf). Temperatures last week were 3.7 degrees warmer than last year and 4.1 degrees warmer than normal. QEP Resources (formerly Questar) reported earnings today. It gave a brief update on its Haynesville operations, brief mainly because activities there have slowed down tremendously. The company currently runs one rig, down from two in February, and will remove that rig in the third quarter if natural gas prices don't pick up. The company didn't specify a threshold gas price, but given the current market, I would expect them to pull it unless something big happens this summer. The rig would be pulled once the company figures out its spacing unit configuration. QEP's capital budget in the Haynesville be around 11% of $1.35-$1.5 billion, or around $148-165 million. That Haynesville budget figure likely would go down significantly if the last rig is pulled. 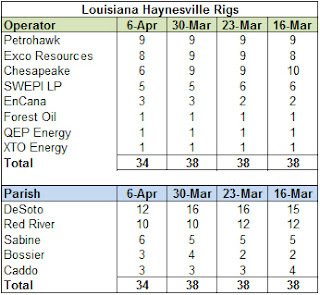 Haynesville production in the first quarter was down a bit from last year to 262 million, but that reflected reduced flow rates and some operational issues about getting wells on line. The company is drilling one well right now and has two waiting for completion. The Haynesville Shale rig count fell by another two rigs this week, dipping to 47. The count was down three in Louisiana to 30 and up one in Texas to 17. Of note this week, Chesapeake fell to five rigs (down from nine two weeks ago) and now is tied for third most rigs in the play with Anadarko and Shell (SWEPI). Fortune Magazine arrived in my mailbox on Friday and there in blue and white was the big cover story: "The United States of Natural Gas" with the caption, "How the New 100-Year Supply of Shale Gas is Reviving the American Economy." Nice. I had just finished reading a big interview with Dow CEO Andrew Liveris in a Fortune issue from last month where he lays out the company's new strategy as one that is built on using the abundance of gas in the U.S. to develop a domestic manufacturing base that creates higher margin, non-commodity products. As one of my neighbors always says, "that's the sh*t."
Maybe the PR firms hired by the natural gas industry are really gaining traction because you can't open a magazine or newspaper without seeing an article about the rebirth of the American manufacturing sector. And the main reason for this rebirth? Shale gas. In any case, businesses are starting to invest real dollars in industries that will lead to lots of steady jobs in the coming years and likely a lot of one-time construction jobs in the near future. It feels like the positive message about shale gas is finally getting out. It has been interesting to watch the reaction to the EPA's new rules on capturing gasses that escape during the completion process for natural gas wells. The industry generally has been quiet about it. I guess they know it's the right thing to do and they got a big win when the rules were delayed a couple of years. Otherwise, the rule calls for many of the same practices currently mandated in Colorado and Wyoming, so I doubt it will be crippling for the industry. The big negative reaction is coming from politicians who are moaning and groaning that regulation will kill gas exploration. That's political hogwash that has more to do with scaring up votes (literally) and fundraising than reality. The natural gas industry would be best served by getting out of the political debate, but unfortunately that ship has sailed. To me the industry should get behind these rules and implement them quickly (assuming they can stay in business with such low gas prices) because they cover the one area that hydraulic fracturing opponents actually do have a point. Methane, the main ingredient in natural gas, is a dangerous greenhouse gas. It is much worse than CO2 but it has a significantly shorter lifespan once released. Studies have pointed out that a certain amount of gas is released at the wellhead and along the transportation chain, which makes natural gas potentially worse for the atmosphere than coal when looking at the full life cycle of the fuel. Industry executives claim they don't want any to escape because it's money in the bank, but I have trouble buying that when they nonchalantly flare gas when they don't have transportation options. Fix a situation that actually is a problem and move forward. Unfortunately, it takes the EPA to make it mandatory, but I view this as one area where it is right to intervene. Methane release is the one big hole in the gas industry's argument that drilling is safe. The Baker Hughes rig count showed a 22 rig increase, bringing the number of working rigs in the U.S. to 1,972. Oil rigs were up 15 to 1,337, gas rigs were up seven to 631 and miscellaneous rigs held at four. By type, horizontal rigs were up 10 to 1,155, vertical rigs were up three to 571 and directional rigs were up nine to 246. There has been much activity surrounding the Tuscaloosa Marine Shale over the past year and Upstream Online has a good article discussing it, including speculation surrounding an imminent TMS joint venture between EOG Resources and Mitsubishi. EOG its interests in around 120,000 net acres in the western portion of the play through a farm-in agreement with Denburry Resources. There is also some discussion about Shell's interest in establishing a foothold in the TMS to shift some of its remaining Haynesville Shale resources to the oily play. It's a quick read. If you have any interest in Chesapeake Energy, read Chris Helman's analysis of CEO Aubrey McClendon's working interest deal on all Chesapeake wells and its possible impact on the company in Forbes. Much has been said about McClendon's sweet deal that isn't looking so sweet right now, and this piece is a pretty objective take on why it is causing fears in the investment community. This week, the EPA released its long-awaited rules governing air quality and hydraulic fracturing. The rules cover gas wells, compressor stations and the transmission network and require a "reduced emission completion" process to capture gas that could otherwise escape and lead to smog or a buildup of greenhouse gasses. The rules are required by the Clean Air Act and the release is timed to meet a deadline created by a court order resulting from lawsuits from environmental groups. The energy industry so far has offered little public gnashing and wailing, possibly because the EPA has delayed implementation of these rules until January 2015 to give the industry time to comply. 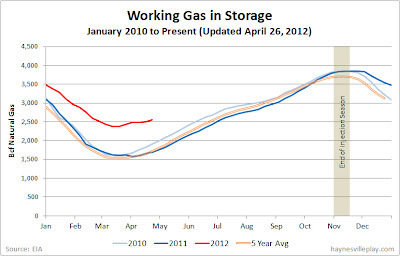 The EIA reported a 25 Bcf net increase in working gas in storage, bringing the current inventory to 2.512 Tcf. The weekly injection was 17 Bcf below last year (+42 Bcf) and in line with the five year average (+26 Bcf). The current storage level is 53.1% above last year (1.641 Tcf) and 57.7% above the five year average (1.593 Tcf). Temperatures last week were only slightly above normal but were cooler than last year's temperatures, which were unseasonably warm. Speaking of Chesapeake Energy, the company's stock is taking a beating today with the disclosure that CEO Aubrey McClendon has borrowed up to $1.1 billion to finance his personal 2.5% working interest in all of the company's wells. This arrangement - bizarre as it is - has been in place since 1993 and is old news, but I think the magnitude of the CEO's debt and the potential for conflicts of interest are spooking investors. It's hard to reserve comment on the arrangement, but I will show restraint. I will say, however, that Chesapeake is a ...complicated company, but it never disappoints when it comes to interesting news. Well, that's a dumb headline. Of course there will be more "monetization transactions" coming from Dealin' Aubrey and his team of whiz kids from Oklahoma. 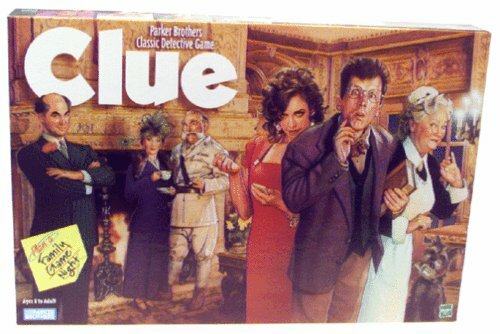 Let's play the game of "Clue" with possible Chesapeake deals. I guess India Oil, Ltd. in the Mississippi Lime with a joint venture. At least that's what The Hindu suggests, reporting that a delegation from Oil India, Ltd. is in the states for a meeting with CEO McClendon regarding a possible deal for Chesapeake Energy's Mississippi Lime assets. This comes on the heels of Monday's announcement of the IPO of Chesapeake's oilfield services company and the announcement last week of three separate monetization deals worth $2.6 billion. No grass grows under the feet of the good folks at Chesapeake as they raise cash at the bottom (hopefully) of the natural gas price cycle. Big news on the bayou: Cheniere Energy today received authorization from the Federal Energy Regulatory Commission (FERC) to build up to four modular LNG trains to facilitate the export of natural gas from its Sabine Pass terminal in Cameron Parish, LA. Now the company needs to wrap up its financing, which should be in the bag, and proceed with construction of the facility. What a long, strange road it's been for Cheniere. Now another "sure thing" multi-billion dollar project to build. 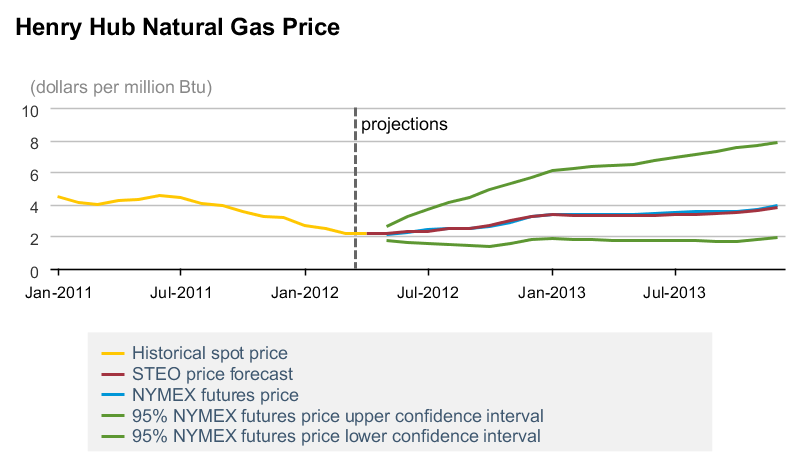 I don't expect the natural gas market to flip on its head again before completion (although now I've jinxed it...). On Friday, President Obama issued an executive order to form a working group of at least 13 federal entities chaired by the Director of the Domestic Policy Council to coordinate federal policy towards unconventional natural gas. The group is called the Interagency Working Group to Support Safe and Responsible Development of Unconventional Domestic Natural Gas Resources (WGSSRDUDNGR?). This move will presumably prevent any one agency from hijacking shale gas policy and oversight. Stepping back a bit to try to look beyond politics and paranoia, I see it as a measured response to a very complicated issue. Shale gas is a once in a generation opportunity to alter the worldwide energy landscape, and it is something that needs to be handled carefully by all participants. Lots of pundits and politicians claim President Obama is trying to kill natural gas. I think that's a total crock of sh*t. Obama is smart enough to know that shale gas is a huge boon to his administration and it creates a win-win proposition for his goals. The economic impact of shale gas can be seen in direct and indirect economic impacts from drilling as well as the growth in the industrial and manufacturing sectors from cheap gas. It creates jobs, it creates exports (an huge push by his administration), and it improves the environment. So, What IS the Real Impact of That Electric Car? I've never been a huge fan of plug-in electric cars. While they make good press about being able to reduce the amount of evil imported oil we consume, they depend on power generated from the electric grid, which is mostly produced by coal in the U.S. So instead of burning oil-based gasoline, we are burning coal. Where is the benefit there??? The Union of Concerned Scientists is coming out with a report today about the environmental impact of electric cars. The graphic below (from the New York Times) shows the relative carbon impact of fueling up a Nissan Leaf electric car in different cities. It's a little hard to comprehend, but the number represents the greenhouse gas emissions, expressed as if it were fuel economy, you would get in different locations. The upshot is that where you see darker colors there is more coal used for electricity generation, and therefore the lower the benefit of the electric car. Lighter colors mean more natural gas and alternative energy (mainly hydro-power). The NYT article points to a great DOE web site tool that allows you to type in your zip code to find out the exact mix of power your utility uses to generate electricity. 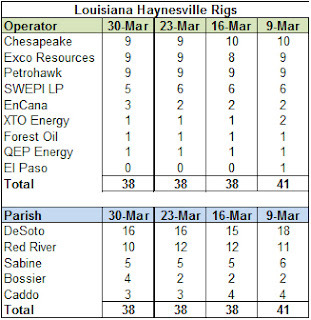 It is interesting to see that in Shreveport, the heart of the Haynesville Shale, uses 56.4% coal and only 34.6% gas to generate power. Carthage, TX uses 56.4% coal and 34.6% gas. Nacogdoches, TX uses 49.5% gas and 34.4% coal. By comparison, New Orleans uses 44.7% gas, 25.5% nuclear and 23.0% coal. What ever you do, do not look at the right side of the graph below, especially not at the blue and red lines that seem to become a purple line. I'm glad you didn't see that chart from the EIA's April 2012 Short Term Energy Outlook, which projects that the price of natural gas will not get above $4/MMBtu through the end of 2013. This is not particularly new news as many analysts make similar projections, but it is not a happy thing for gas fans to see. Spreadsheets and maps have been updated. 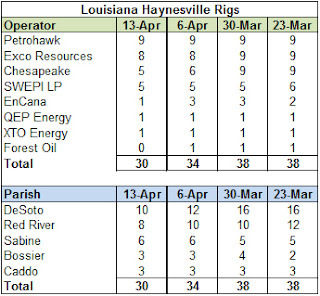 The Haynesville Shale rig count dropped by two this week to 49. The count was down by one in both Louisiana (33) and Texas (16). Spreadsheets and map have been updated. The Baker Hughes rig count showed a 29 rig decrease, bringing the number of working rigs in the U.S. to 1,950. Oil rigs were down seven to 1,322, gas rigs were down 23 to 624 and miscellaneous rigs were up one to four. By type, horizontal rigs were down 20 to 1,145, vertical rigs were down 15 to 568 and directional rigs were up six to 237. The weekly EIA working gas in storage report showed an 8 Bcf net increase, bringing the total gas in storage to 2.487 Tcf. The weekly injection was in line with last year (+7 Bcf) and 14 Bcf below the five year average (+22 Bcf). The current storage level is 55.5% above last year (1.599 Tcf) and 58.7% above the five year average (1.567 Tcf). Temperatures last week were 4.1 degrees warmer than last year and 5.7 degrees warmer than normal. I saw a blurb on CNBC that T. Boone Pickens is calling a bottom for falling natural gas prices just below $2/MMBtu because of declining natural gas rig count. Both Henry Hub spot ($1.91/MMBtu) and the NYMEX ($1.98/MMBtu) closed below $2 today. Personally, I have trouble believing that anyone can predict how gas prices will react with the expectation that natural gas storage will fill up in +/- six months. With the current storage level 934 Bcf above the five year average (pending Thursday's data release) and a mild summer predicted, I don't think it's a stretch to see storage get filled up in early autumn unless there are significant production curtailments. 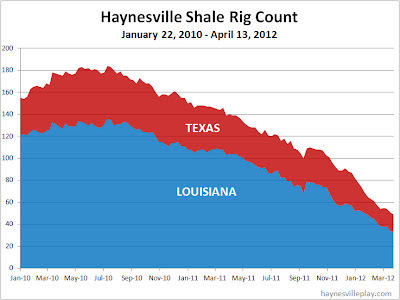 I definitely don't think declining natural gas rig counts are enough to avoid topping out. But even if we have hit bottom, price-wise, I don't see anyone predicting higher prices. Is flat-lining at $2/MMBtu the best we can hope for? I remember last year when prices stuck around $4/MMBtu thinking how good $6 looked. The bar of expectations keeps getting lower. WHAM! Thank you sir, may I have another? I updated the Mid-Bossier spreadsheet and map with XTO Energy's new Pirates completion in Texas. 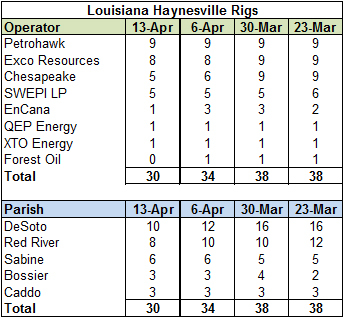 The Haynesville Shale rig count fell by three this week to 51. Louisiana was down four to 34, while Texas was up one to 17. This week, Chesapeake (7), which has easily topped the rig count for the past four years and has had as many as 36 rigs working at once over the past two years, has fallen to third place behind Petrohawk (9) and EXCO Resources (8). It is interesting to see that Petrohawk has bolstered its presence in the Haynesville Play after its acquisition by BHP Billiton. 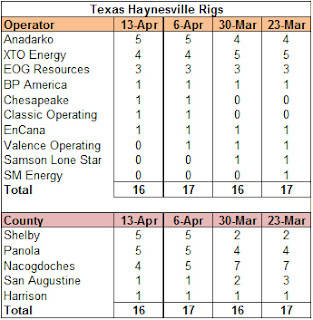 El Paso, whose E&P division is in the process of being purchased by private equity investor Apollo, dropped off the chart this week after four weeks of zero rigs. The company was working four rigs as recently as mid-January 2012. All eyes will be on Apollo to see how they proceed post-acquisition. Shell Looking at Gas-to-Diesel in Louisiana? In another sign of long-term benefits from the shale gas revolution, the Wall Street Journal reported yesterday that Royal Dutch Shell is evaluating building a gas-to-diesel processing plant along the Gulf Coast, possibly in Louisiana. The article cited anonymous sources and did not offer specifics about possible locations. Currently, Sasoil Ltd. is evaluating a gas-to-liquids plant adjacent to its existing chemical plant near Lake Charles, LA. The proposed plant would entail an investment of around $10 billion and would be similar in size to the company's Pearl plant in Qatar. According to the article, Shell thinks it has learned enough from Pearl to reduce the capital investment from the $18 billion spent on Pearl. If this proposed plant goes forward, it is still years from coming online, but the discussion of multi-billion dollar investments it is a strong statement that shale gas has changed the energy landscape and is likely to cause huge ripples in chemicals and manufacturing in the coming decades. While there are many skeptics out there who say that shale gas estimates are overblown, seeing Shell, an operator in the Haynesville Shale, making such possible moves gives me confidence in the industry's projections for shale gas. Shell exuded that same confidence when it picked a site in SW Pennsylvania for an ethane cracker plant because of its access to the Marcellus Shale. The Baker Hughes U.S. working rig count was unchanged this week at 1,979, but there was plenty of movement under the surface. Oil rigs were up 11 to 1,329 while gas rigs were down 11 to 647, the lowest level in recent history. 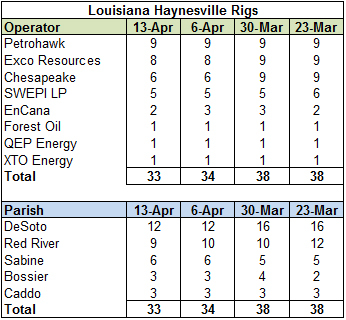 Miscellaneous rigs were unchanged at three. 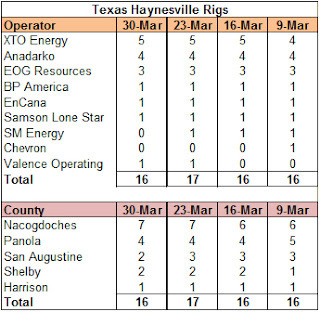 By type, horizontal rigs were down 15 to 1,165, while vertical rigs were up 17 to 583 and directional rigs were down two to 231. The weekly EIA working storage report showed a 42 Bcf increase in storage bringing the level to 2.479 Tcf. The weekly injection was 71 Bcf higher than last year (a withdrawal of 29 Bcf) and 34 Bcf above the five year average (+8 Bcf). The current storage level is 55.7% above last year and 60.5% above the five year average. Yesterday, Encana Corp. announced that the company was seeking joint venture partners to develop its liquids acreage, including 1.2 million net acres in four fields in the U.S. (including the Tuscaloosa Marine Shale) and 375,000 net acres in one field in Canada. Today, Bloomberg reports that Malaysian national oil company Petronas is looking at a possible Canadian acquisition after an interview with the company's CEO. Analysts immediately pointed to Encana and to a lesser extent Talisman as potential targets. It probably doesn't help the rumor mill that Encana CEO Randy Eresman was in Singapore, a stone's throw from Petronas' HQ in Kuala Lumpur, delivering a presentation a day before Bloomberg interviewed the Petronas CEO. While Encana is touting its oil and NGL properties, Petronas likely is more interested in its natural gas holdings and its 30% interest in the planned Kitimat LNG export facility in western British Columbia. With a long-term view and the backing of the Malaysian government, Encana probably looks very tasty. It doesn't hurt that natural gas is trading at obscenely low prices in North America and Encana is undervalued relative to other producers. I think the interest in the Kitimat facility is especially attractive to the Malaysian company, as it is farthest along in the Canadian approval process (see green dot on map below; first exports expected Q4 2015 or Q1 2016) and is one of the few LNG export facilities likely to be approved on the west coast. Private equity investor KKR continued its natural gas property buying spree yesterday, agreeing to a deal to purchase acreage in the Barnett Shale and Arkoma Basin from WPX Energy, which was spun out of the Williams Companies. The acquisition will be made through KKR's subsidiary KKR Natural Resources (KNR), which will pay $306 million for 27,000 net acres in the Barnett ant 66,000 net acres in the Arkoma. The Barnett acreage is currently producing 67 MMcf/day. KNR will partner with Premier Natural Resources in the acquisition, as it has done in most past deals. While natural gas fans hate low gas prices, deep pocketed buyers like KKR see it as a huge opportunity to buy low/sell high. KNR has spent about $900 million on gas properties since the company was founded two years ago, and I don't expect the spending spree to end any time soon. Much of the targeted acreage will look good in a few years but now is dead weight on a publicly traded producer's balance sheet. 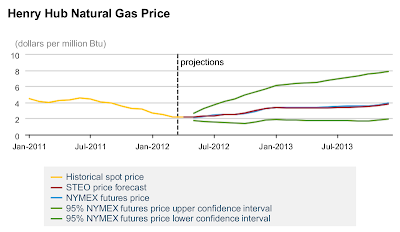 The spot price of natural gas as measured at Henry Hub was below $2/MMBtu for the second straight trading day. This afternoon, gas closed at $1.87/MMBtu, the lowest price since the beginning of the shale gas revolution five years ago. In the first week of September 2009, gas dipped to $1.88/MMBtu on a Friday but recovered to $2.45/MMBtu by Monday. No such luck this time: this past Friday, gas closed at $1.98/MMBtu, but the price kept dropping today. How low will it go? In some articles about the gas storage/price situation some analysts suggest that providers might give gas away (presumably for logistical reasons). If that comes to pass, I guess the price has a looooong way to go down since zero is still pretty far away. 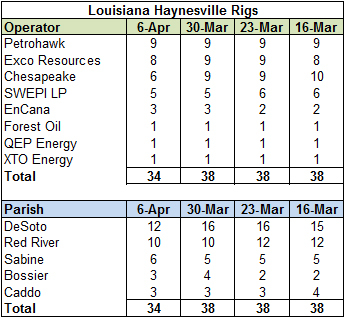 The Haynesville Shale rig count was down one this week to 54. Louisiana held at 38, while Texas was down one to 16.